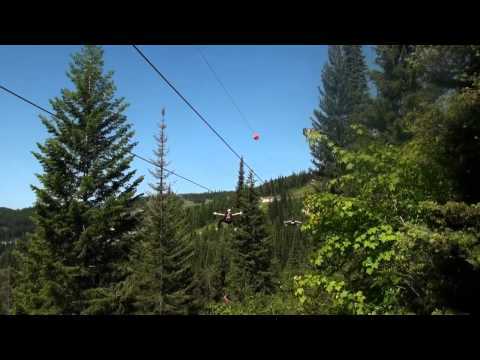 Whitefish Mountain Resort Zip Line Tours: a 5-Zip Tour and a 7-Zip tour. Both tours feature zip lines ranging from 100 to 1,900 feet long! Tours are guided by two of Montana's finest guides who will teach you the techniques, lead you through the tour and keep you entertained. Each person will be outfitted with a paragliding harness and zip line trolley so you can fly comfortably and safely. Up to 14 people will be in your group. You will fly two at a time on side-by-side lines. Tours go out roughly every half hour between 8:30am-5:30pm. Reservations are strongly recommended call 406-862-2900 to book today! The 7-zip tours lasts approximately 2.5 hours, and the 5-zip tour about 2 hours. Check-in 20 minutes before at the 2nd Level of the Base Lodge. The Zip Line Tours start out of the Base Lodge at Whitefish Mountain Resort. Turn on Glades Drive from Big Mountain Road.